would like to ask about a question that I came across in one of my assessment books. Appreciate the help that I can get. Qns: In an investigation, two substances X and Y of the same mass are dissolved in the same volume of water. It is found that X dissolves faster than Y. Which of the following graphs correctly shows the solubility of the substances against time in this investigation? The answer given is A.
I would like to ask why is that so. Intuitively, I would think that the solubility would be a constant since solubility is defined as "the maximum amount of solute that will dissolve in a given volume of solvent at a given temperature and pressure", therefore it will not change with time as the solute is dissolving. Even if we're talking about rate of dissolving here, shouldn't the rate be decreasing, as when a higher concentration of particles are dissociated, there would be more of the dissociated particles in the solvent which will shift the equilibrium to the left? Ivan's comment really nailed the problem, but I'll throw in a bit more. In the question the term solubility would be ok in an English class, but the term is incorrectly used within chemistry. The more correct tense would be solvation. Likewise the diagrams should have solvation rather than solubility. In an investigation, two substances X and Y of the same mass are dissolved in the same volume of water. It is found that X dissolves faster than Y. Which of the following graphs correctly shows the solubility solvation of the substances against time in this investigation? According to question the rate of dissolving of X is higher than that of Y so the slope of the solubility-time curve will be higher for X that's why A should be the answer! 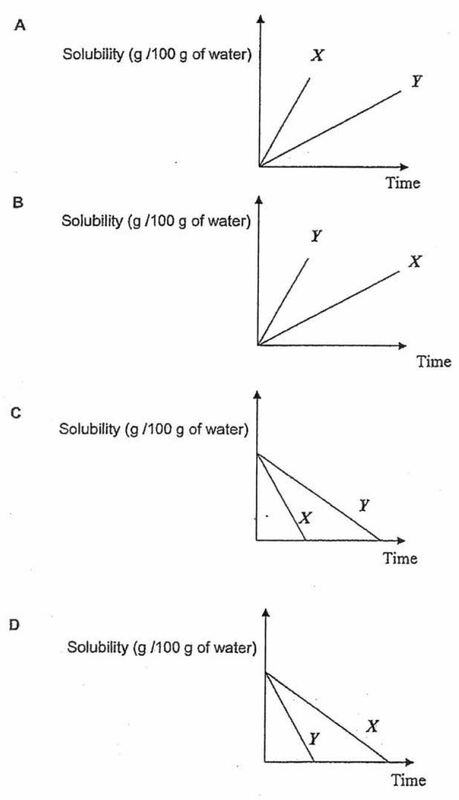 It is 'A', the graph is showing the solubility of a substance over time , the answer 'A' shows that 'X' completely dissolves in less time than 'Y'. Different substances have different solubility values in a solvent, so the same mass of two different substances in the same volume of the same solvent can have different solubility values. A more soluble substance will dissolve at a higher rate. How to calculate the new concentration of a solution after adding more solute and convert it to ppm?